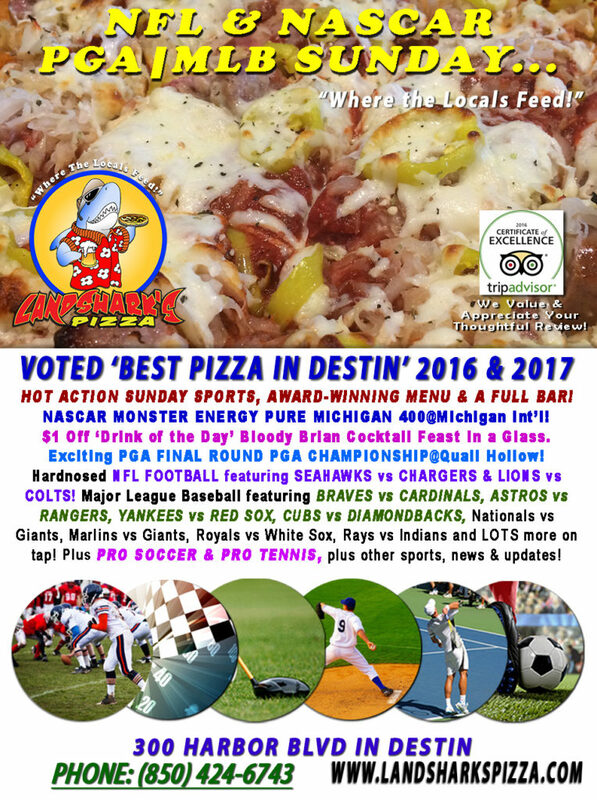 / Best Award Winning BBQ Destin FL / Action Sunday NFL, NASCAR Pure Michigan 400, PGA CHAMPIONSHIP Final, MLB & Award-Winning Menu! 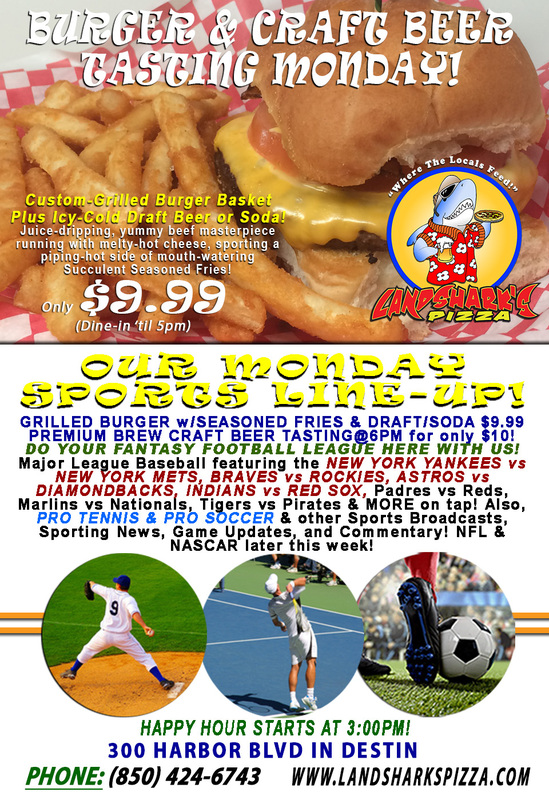 Action Sunday NFL, NASCAR Pure Michigan 400, PGA CHAMPIONSHIP Final, MLB & Award-Winning Menu! A belly-busting menu of delicious eating from Award-Winning Wings, Oven-Baked Subs & Calzones to The Best Traditional BBQ, loads of appetizers, and A FULL BAR! 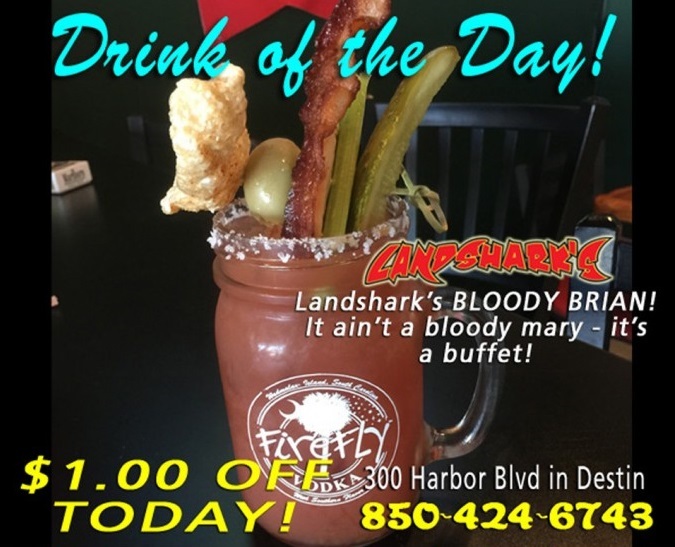 LANDSHARK’S DRINK OF THE DAY – $1.00 OFF your BLOODY BRIAN Super Cocktail – like having a feast with a straw in it! DON’T FORGET TO HOST YOUR FANTASY FOOTBALL LEAGUE HERE@LANDSHARK’S! SPORTS ON OUR ARMY OF BIG SCREENS – NASCAR Monster Energy Cup Series Pure Michigan 400@Michigan Int’l! Hardnosed NFL FOOTBALL featuring SEAHAWKS vs CHARGERS & LIONS vs COLTS! 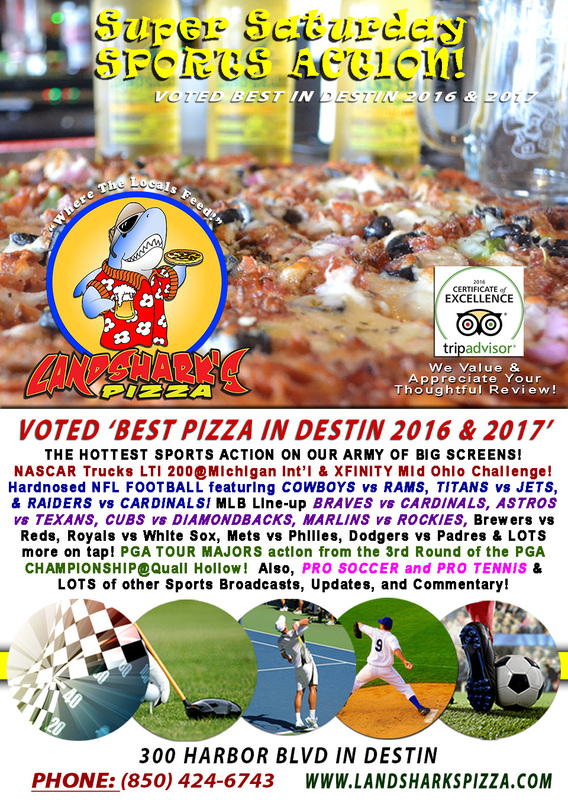 Major League Baseball with BRAVES vs CARDINALS, ASTROS vs RANGERS, YANKEES vs RED SOX, CUBS vs DIAMONDBACKS, Nationals vs Giants, Marlins vs Giants, Royals vs White Sox, Rays vs Indians & LOTS more on tap! Final Round PGA GOLF MAJORS action from THE PGA CHAMPIONSHIP@Quail Hollow! Also, PRO SOCCER and PRO TENNIS coverage plus plenty of other Sports Broadcasts, Sporting News, Analysis, and Commentary! Previous Post: « Super Saturday NASCAR Double, NFL, PGA Championship, MLB & More|Bloody Brian Cocktails!